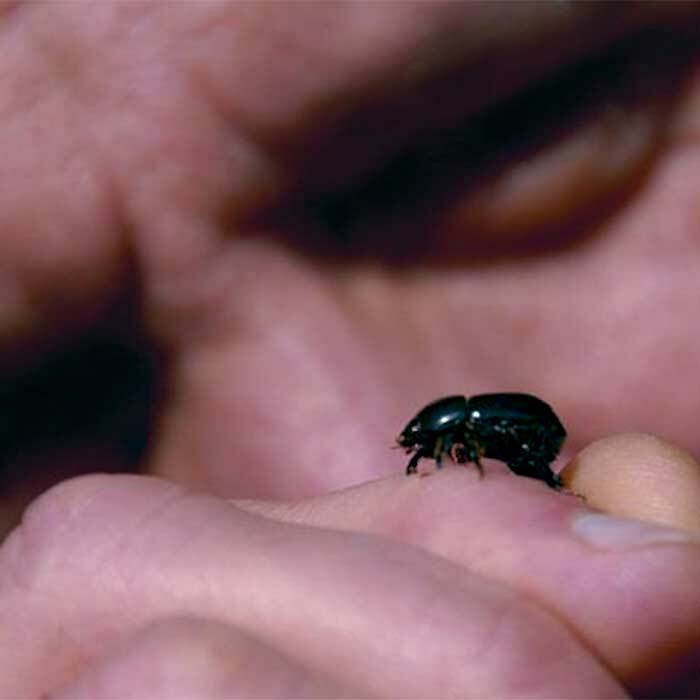 Black beetle is an African species but has been present in New Zealand for several decades. It is at the limit of its climatic tolerance and is restricted to Waikato and Bay of Plenty northwards with a southward coastal extension into northern Taranaki and Gisborne. 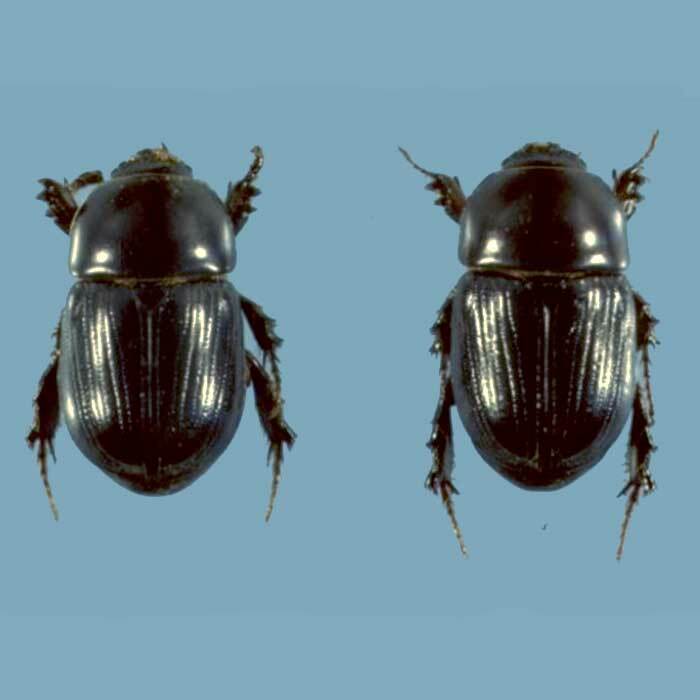 Black beetle outbreaks occur sporadically and follow above average spring temperatures. It has a high temperature requirement for most life processes. Female longevity, number of eggs produced, egg viability, larval survival, growth rate and the amount they eat are all favoured by temperatures greater than 20°C and are severely inhibited at between 10-15°C. 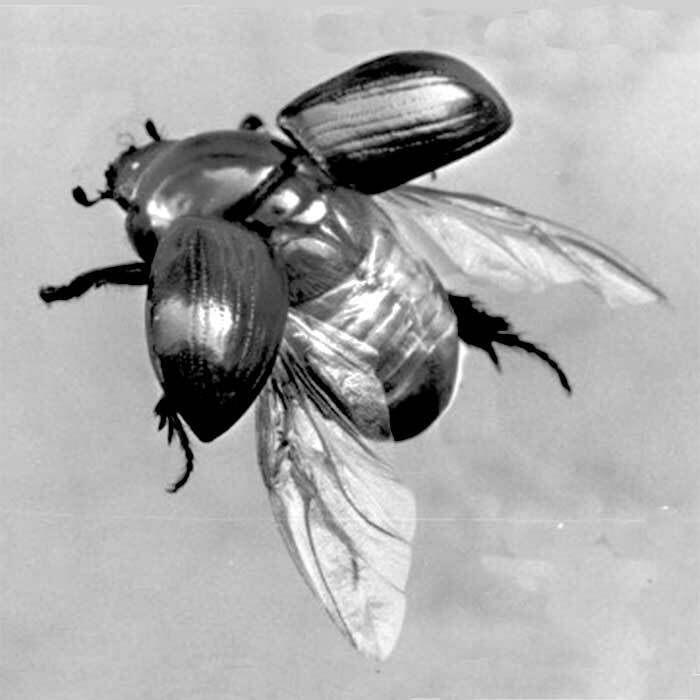 Adult beetles are a characteristic glossy black and about 15 mm long with females being larger than males. They are usually found in the top 1 cm of soil. They undergo extensive dispersal flights in spring and autumn but surface air temperatures must be above 17°C for flights to occur. The eggs, about 2 mm long and ovoid to spherical in shape, are laid singly in soil, close to the surface, in spring. 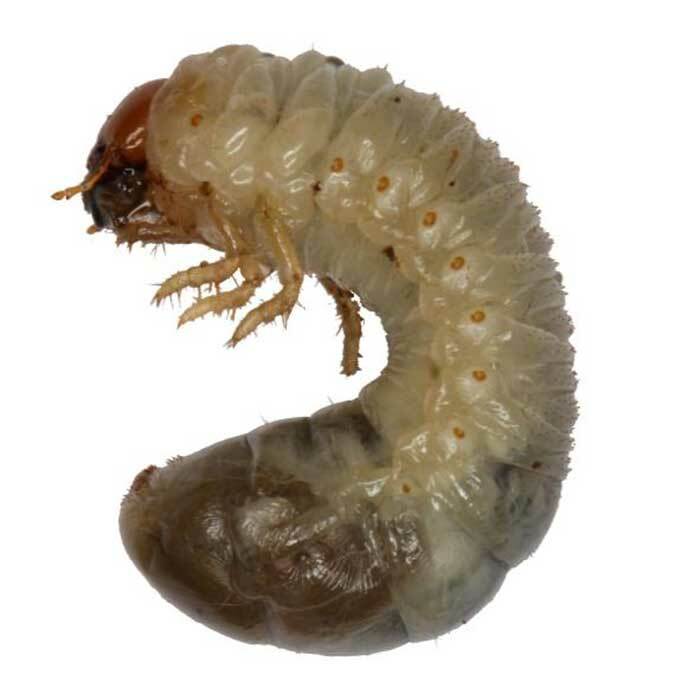 The creamy white C shaped larvae, usually found in the top 10 cm of soil, appear superficially like common grass-grub but are larger reaching 2.5 cm when fully grown. These fully grown larave are present and cause damage in summer. In black beetle areas any grass-grub larvae present will be very small (less than 10 mm) at the same time of year. Black beetle larvae can also be distinguished from grass-grub by breathing pores (spiracles) that occur down the length of the body. In grass-grub these are not obvious but in black beetle they are prominent and show clearly as orange spots. Like grass-grub the larvae pass through 3 stages before pupating and emerging as adults. Pupation occurs in February/March and the beetles overwinter. These beetles will not lay eggs until the following spring. The beetles and larvae of black beetle feed on several pasture grasses including annual ryegrasses, perennial ryegrasses, tall fescue, paspalum and kikuyu. Grasses with high carbohydrate levels in their roots favour adult development and ultimately the size of the populations that develop. larval feeding is on roots often close to the surface. In severe infestations the turf can be rolled back owing to the destruction of the root system. In less severe cases the pastures can become clover dominated as legumes are not a favoured food source, or they can become open and susceptible to weed invasion. Damage to pastures from larvae can appear similar to common grass-grub but occurs over summer (January to March) as opposed to autumn/winter. The damage threshold for black beetle larvae is approximately 20-30/m2 which is considerably lower than for grass-grub. Patches of yellowing tillers that pull easily from the pasture may become noticeable in autumn and spring. This is a sign of adult feeding. Adults may feed on roots or on the base of plants at soil level. Any more than 10 adults/m2 in pasture are a concern but populations of 30/m2 have become common and they can reach as high as 95/m2. In maize 1-2 beetles/m2 in spring are sufficient to cause an economic loss. Both larvae and adults can be particularly destructive to newly sown grasses. Beetles and larvae will also feed on brassica roots, maize, sweetcorn, kumara and strawberries. 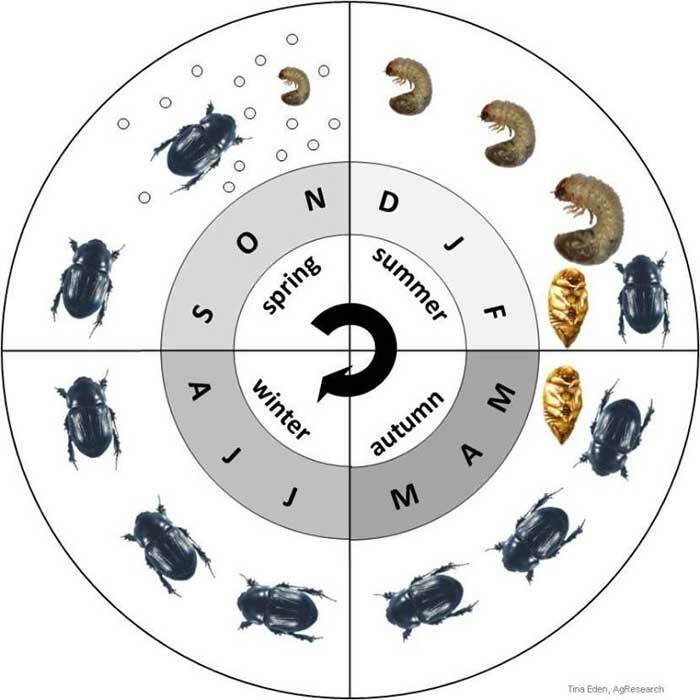 A series of dry summers and autumns since 2007/8 has contributed to higher than usual numbers of black beetle particularly on light soil types. Pugging as a result of plant destruction can be a serious issue. Damage is generally more severe on dairy than on sheep and beef farms but occurs on all types. There are few control options available for black beetle other than sowing resistant grasses. Ryegrasses containing the AR37 endophyte are the best option in black beetle prone areas but some protection will also be gained using Endo 5 or NEA2. Wild type (or standard endophyte) also protects from black beetle feeding. Max P in tall fescue helps protect that grass.These endophyte fungi produce toxins that deter the adult black beetles from feeding and if the beetles cannot find alternative plants to feed on they will die before they can lay their eggs. The endophytes do not directly affect the larvae. AR1 infected ryegrasses ARE NOT protected from black beetle feeding. For endophyte selection seehttp://www.dairynz.co.nz/page/pageid/2145866515/Pasture. Grass type can affect beetle development. Grasses with high root levels of carbohydrate enable faster beetle maturation. These include paspalum, kikuyu and several other weed grasses. Eliminating these grasses from pasture will slow development and reduce the problem. Annual ryegrasses are good host plants for black beetle. No chemicals are registered for control of larvae or adults in pasture. Imidacloprid is available as a seed coating. The use of a break crop that is unfavourable to black beetle can provide a clean seed bed and aid establishment of new pasture. Brassicas, maize, legumes and chicory do not support full development of black beetle and can be used in pasture renovation programmes.